I visited the exhibition "On the Edge - Israeli Paper" by myself during the Pesach break. None of my family were keen to join me, but in the end I was glad to be there alone. I simply couldn't bring myself to leave the gallery space and kept going back to see my favourite pieces over and over again. If my teenage kids had been with me, they just might have been nagging me to leave! According to the museum's website, the exhibition, the third of its kind at the Eretz Israel Museum, seeks to focus attention on paper as a medium with diverse and complex characteristics, a material that can be applied and developed in numerous creative ways. 65 artists who work in the plastic arts, product designers, graphic designers, textile designers, architects, jewellery makers and paper artists are showing their work; veteran artists who have been working in paper for a long time alongside young artists who are now taking their first steps in the world of art and design. Their works challenge the material and extend its boundaries, using the essential characteristics of paper in diverse and fascinating ways. Climbing the stairs to the gallery space, I was greeted by a wall-piece created by Avi Sevilya, whose work I recognised, having seen it previously at The Paper Festival back in 2013. 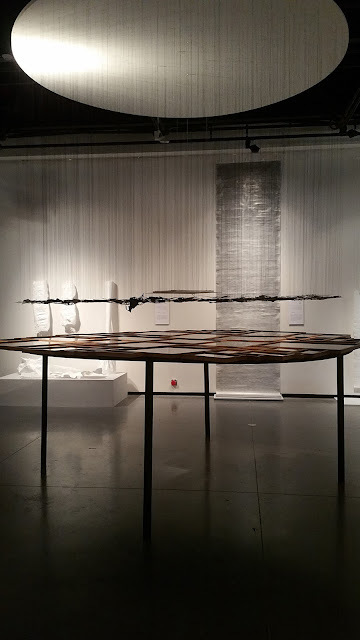 The wall-piece is hand made from hundreds of thin rolls of newspaper, zip ties and wires which have been laboriously intertwined, and seem from afar like a magic plant or reptile. The flat paper has become three-dimensional, yet the work, in its entirety, has the air of a linear drawing. I loved it. The installation 'Rhythm and Blues', above, was created from carbon papers in black and blue colours covering a spiral shape which floats in space. The carbon paper has been used in its entirety or taken apart into thin layers, some of which are transparent and some have texture. 'La Grande Robe' by Merav Peleg is inspired by a traditional Moroccan Jewish wedding dress from the 19th century, which passes from bride to bride in the family. Made of Fedrigoni paper, the robe comes to life with modern technology - the traditional decorative embroidery styles woven by the women have been digitally cut by Highcon, an Israeli startup company that converts manual print processes into a digital process. The words "Woman of Valour" from the biblical verses praising the virtuous women in Jewry (Proverbs 31:10-31) are also turned into a decorative pattern around the base of the dress. 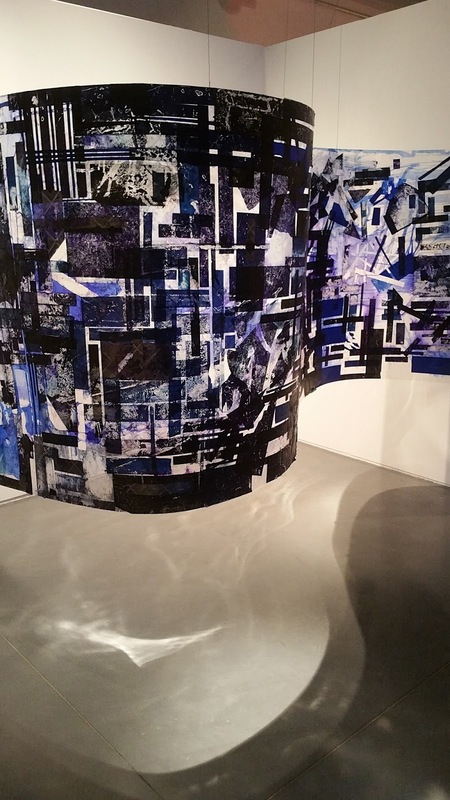 One of the pieces I kept returning to was Noa Yekutieli's 'Fragmented Substance', above. The installation is part of an ongoing project 'Mountains of Narratives' focusing on the construction and deconstruction of memory and narrative. In this installation, events and stories are broken down into visual fragments, then assembled to create a new narrative. 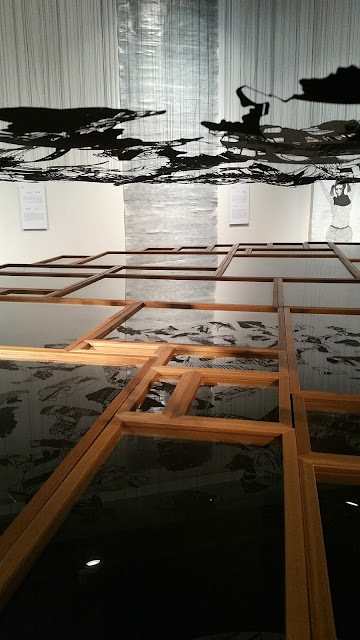 The 200 manually cut paper pieces composing the installation are hung at eye level and are visible through their reflection upon sixty glass frames placed underneath. I photographed this piece many times until I could get some semi-decent images, though they still do not do it justice. The organic, curving shape of 'From North Japan to the Southern Negev', top, is made from a single paper sheet. It was made using an ancient Japanese technique, using paper mulberry fibres (kozo in Japanese) from Eastern Asia. The strong braided rope which merges with the lace-like structure is made of the leatherwood shrub. The fibres of the shrub branches are used by the Bedouin in the Southern Negev to braid ropes. Here the artist has combined plants with similar traits into a single harmonious work. The artist who created 'Within Itself', two wooden cones containing a fabric of folded papers, centre, considers this work a metaphor for an artwork being pushed into the world. With 'Phantom Ships', above, a flight of ships in an imaginary space looks like a play of shadows or a celebration of kites in the sky. The work was inspired by descriptions of whale hunting, and the shape of the ship was drawn from engravings found on working tools and decorative objects made from the bones and teeth of the hunted whales. The piece is made from a rich variety of papers which were collected from nature, the street and the artist's home. Another favourite of mine was 'Heirloom Seeds' by Dania Chelminsky, above. Brooches or beads shaped like shells and seeds function as a metaphor for man's interference in nature. 'Hidden Land', below, created from the Haaretz newspaper, shows an expansive area which looks liken a model of a forest or a city made of towers. Created by a jewellery designer, the artist searched for a way to endow paper with flexibility and elasticity and breathe life and movement into the piece. These two delicate items look like bowls. Made of intertwined paper and threads, soaked in water, sewn, torn and moulded into different shapes, they represent opposing and complimentary forces (e.g. Ying and Yang). 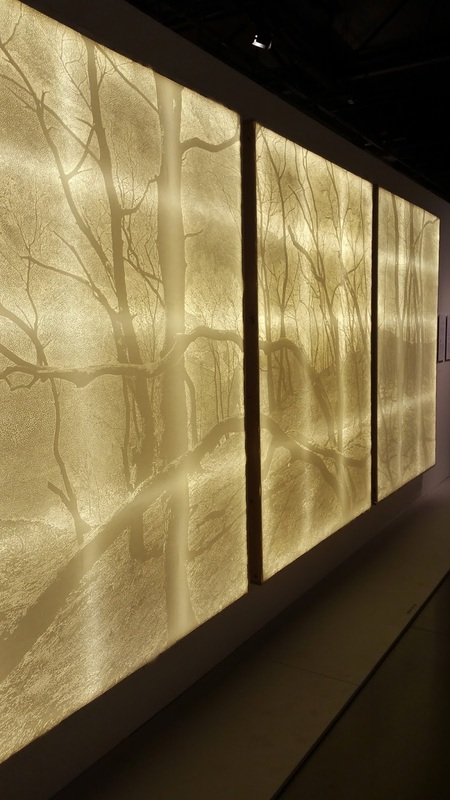 The enormous triptych 'White Memory', below, depicts a magical, bright white forest.The work is based on a photograph of Mt. Carmel, which was taken right after the deadly fire of 2010. The burnt and sooty forest is drawn by meticulously perforating the large-scale paper surface with needles of changing thickness. The light emanating from this work highlights the perforated outlines, making it look like a jewel, in stark contrast to its grim and fraught content. 'Monarch Migration', above, is a wall-piece composed of items whose shape and arrangement evoke archival exhibitions of insects and butterfly collections in natural history museums. From afar, they look like colourful and seductive creatures, yet a closer examinations reveals that they are in fact representations of tanks, helicopters and submarines which have served in the wars of Israel throughout the years. Every item describes a specific instrument of war, and together they compose an entire arsenal. The artist inverted, duplicated, and twisted the schematic shapes of the instruments, thus defamiliarising them. The 'Ready to Wear' necklace, top, was created by a silversmith and is constructed from triangular units made from the pages of used books. The jewellery series 'Granulation', of which this ring is just one piece, consists of a variety of rings and brooches focusing on the granulation technique, practised for thousands of years in different cultures. In this technique, the jewels are made from granules of precious metal. The granules in this collection were made from wet paper squares and glued to jewellery made from Bristol board. The 'Persian Rug', top, another personal favourite, follows a section of the large, rich rug which covered the guestroom floor of the artist's childhood home. This Persian rug was a valued and meaningful object, which reflected the family's material culture in all its splendour. The artist distances herself from her cultural identity by "weaving" her rug from masking tape rolls painted in degrading colours, contrasting the bold colours of the original rug, and by trading the high quality material of the Persian rug for cheap materials glued into a relief. 'Epidermis', middle, a flat wall covered with paper, centre, turns paper into a soft, sculptural object with depth. 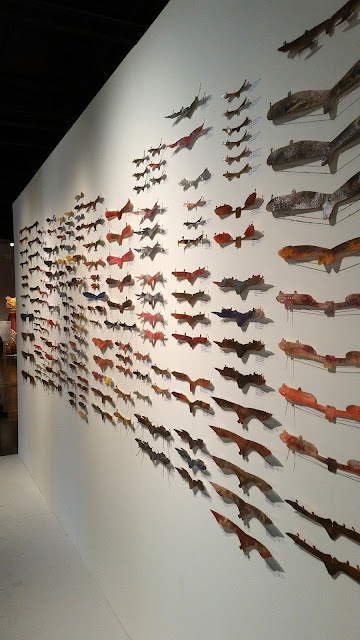 Finally, 'Grid 128', a wall-piece created by Ilan Garibi, an origami artist whose work I was also already familiar with, presents a collection of paper models representing his trademark cyclic folding method. The title - Grid 128 - represents an extreme example of the origami tessellations method, which is represented in Garibi's piece by a black hexagonal model. It was a wonderful exhibition. This is just a sample of the incredible pieces on show. As I have already mentioned, this was the third exhibition of paper art at the Eretz Israel Museum. Of the three exhibitions, the current one is supposedly the most daring and adventurous. The big question is, how on earth did I miss the previous two? * This post has been shared on Travel Tuesday, Wednesday around the World, Little Things Thursday, Thankful Thursday, Thursday Favorite Things, Travel Photo Thursday, Share Your Cup Thursday, City Tripping, Seasons and Wordless Wednesday (on Tuesday). Thank you for sharing this exhibit with us, Lisa! I would love to see it in person, but your descriptions are the next best thing to being there. I don't think I have ever seen paper art before. Very interesting! Amazing exhibit Lisa! I find going to museums alone is best. It tends to be a personal experience and you can spend as much or as little time as you want on each piece of work. Wow, such creativity with paper. You can't help but be impressed with the talent of the artists. Thanks for linking up this week. Hope to see you back again next week. What a beautiful exhibition! Who knew paper could be so versatile? I can see why you didn't want to leave, sometimes being alone is a blessing! That exhibit seems right up your alley! Like it was made for you. Thanks for sharing the tour. Wished I had been there with you - some works are so ingenious! For me the top piece is the rust colored piece, with the Hebrew letters at the bottom, even before I knew what it represented! Are the flowers on top of the paper? Oh, it steals my heart. Then the piece with the wood frames reflecting what is above is stunning in a very different way! Thank you doesn't describe for sharing this with All Seasons. This exhibit is really a treat! Have a lovely week, Lisa. It boggles the mind when you see so many diverse uses for paper! Wow! I can relate to being glad that you were alone to see what you want. I miss some things because I don't want to hold up those with me. It is an intriguing medium and I love that Veteran artists and emerging artists are showing in the same exhibition. It would be a real boost to the new artists and keep it on edge. Love that first photo! I'm catching up on blog-reading, and am so glad I found this post! Everything about this show looks and sounds wonderful. I would have been there for hours, revisiting pieces just as you did. Thank you for posting such good photographs and descriptions!